Christina Aguilera is the latest and greatest to be sharing her walk-in-closet half-nakedness with the world via the ever reliable ‘anonymous friend’ taking a picture they promise will never be seen. Oh please this is about as shocking as Berkeley being on the other side in an American war. These pictures are posed. Anyone who thinks this is a “hack” rather than a PR stunt is as gullible as these folks. A memeorandum thread on this? And when Sarah Palin came to prominence, everyone on the internet was scouring to find bikini pictures of her as well. They like to paint conservatives as frigid, dried up, ugly old prudes, and of course, that couldn’t be further from the truth. And they hope that showing pictures of a conservative — or their family members — in bikinis will mean that other conservatives will be outrageously outraged. They’re always shocked when bikini photos do not, in fact, derail conservative candidates’ campaigns. It’s no different that our friends on the left being convinced that tea party members will be absolutely outraged at the sight of a confederate flag being burned. To paraphrase what I said about this type of thing many months ago the fact that some people are making what they are of this say a whole lot more about them then it does about us. They have watched too many episodes of Family Guy & Jon Stewart and no longer can tell the difference between real conservatives and extreme parodies. They got paid to write this. No really? I thought they would open it up on special occasions, birthdays, national holidays, drunken parties for billionares etc. Suttles’ announcement seemed to alter the strategy that Coast Guard Admiral Thad W. Allen (ret. ), the federal government’s point man in the disaster, had described on Saturday. Allen had extended a two-day “integrity test” on the well until Sunday. But, Allen said, when the test was eventually done, it would likely be re-opened and connected to pipes that would siphon the leak up toward ships on the surface. But on Sunday, Suttles said that the process of fitting the well with those pipes would have allowed oil to flow into the gulf for perhaps three days. Instead, he said, the “test” of the closed cap would continue indefinitely. A BP spokesman said the decision was made in consultation with the government, and that Allen has the authority to have the well opened if he sees the need. 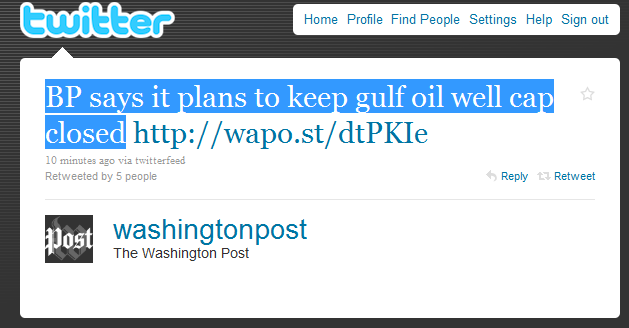 I think that BP and the administration would much rather not have oil flowing regularly into the Gulf live on camera. Is this the same General Petraeus? I know that name from somewhere and I’m pretty sure it’s spelled the same. Futrell goes on to list the differences between the two Petraeus’ and his confusion. The answer seems to me quite simple. Petraeus is a time Lord. His ability to turn spend so much time dealing with individual tribes obviously comes from being able to use his TARDIS to go back in time to learn all these customs and travel back and forth to have the time to get to all of these places. As for the attitude change, that’s easy; he has obviously recently regenerated and like the Doctor’s daughter Jenny had one of those rare regenerations where his physical appearance doesn’t change. This would also explain the different take of the media, they without a question didn’t care for the 1st version of Petraeus but since regeneration changes personality then of course they are looking at him in a different light. Now it simply remains to be seen if this new regeneration of David Petraeus is just as effective a soldier as the previous one.